Horizon’s commitment to high-quality vessels guarantees state-of-the-art design, exceptional finish and excellent seakeeping. Each Horizon vessel is subject to stringent and continuous inspections at every stage of the build, from initial lay-up, fit and finish to the final installation of engineering systems. Each of the four Horizon facilities is independently ISO 9001 approved and utilizes the most advanced technologies to assure quality throughout the production process. Horizon is recognized by the world’s leading classification societies, including Lloyd’s Register (LR), Det Norske Veritas (DNV) and Nippon Kaij Kyokai (NK). Horizon is currently the only yacht builder in Asia that has obtained full DNV Class Classifications. A tank test is comparable to a wind tunnel for aerospace and automobiles. A variety of scale models of the hull design, from 1:8 to 1:12, are made and towed along a water-filled tank up to 1,000 feet (300M) in length. A towing cart equipped with sensors and microprocessors tows the model and collects results for computer analysis. All Horizon yachts undergo resistance and wave-encountering tests in cooperation with international test tanks such as SSPA and HSVA as well as local academies including USDDC, NTU (National Taiwan University) and NTOU (National Taiwan Ocean University). 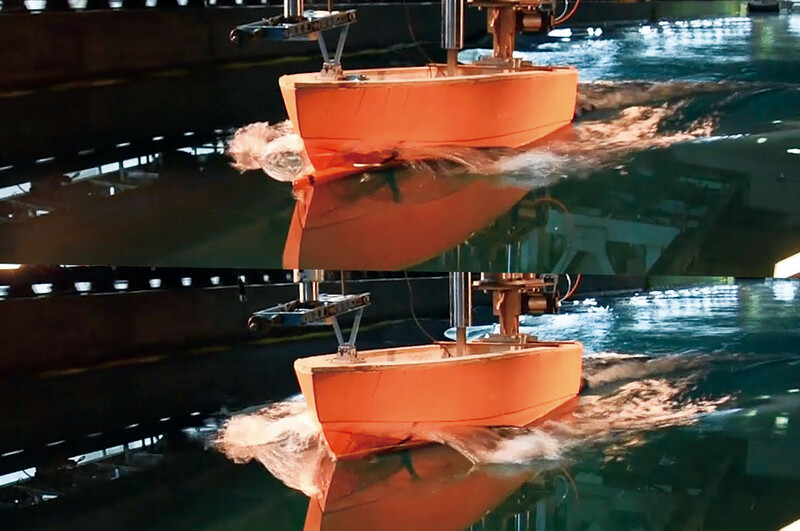 A series of tunnel wedge angle change tests at NCKU (National Cheng Kung University) resulted in a 1-knot speed increase for the RP120 yacht, and the Horizon E88 underwent both resistance and random wave-encountering tests in SSPA to ensure a seaworthy yacht. The most recent test conducted in SSPA was for the design of an 85-footer (25M) with an innovative concave hull design. To ensure yacht quality, Horizon begins with the basics: a raw material test. Horizon has its own laboratory to examine raw materials, finished Fiber Reinforced Plastics (FRP) parts and hull appearance. A Universal Testing Machine analyzes and monitors the properties for raw material assurance – the tests for material properties include tensile strength and modulus, bending strength and modulus, and elongation. These tests refer to ISO 527-4, ASTM C393 or ISO-178 standards, and reference the data from material properties, such as gel coat, resin, fiberglass, structural adhesive and core materials, to check that they have been built up completely and accurately. Because fiber content and FRP hardness are the main parameters in verifying the quality of FRP, Horizon yacht samples also undergo a burn test to measure the fiber content and a Barcol Impressor is used to detect the FRP hardness. Fiber content is a critical aspect when analyzing the strength of current fibers or the bonding between fiber and resin. Horizon implements the most advanced Non Destructive Testing (NDT) technology – commonly used in the aerospace industry and military applications – to detect the internal quality and structural integrity of hull components without damaging the component. Atech is the only composites manufacturer in Taiwan applying NDT to the critical areas of every yacht component. We have further invested in the technology by establishing Ultrasonic and Lockin Thermography inspection methods to ensure a more consistent final product. The Ultrasonic NDT method works by monitoring the sound waves within the composite part. If a defect is detected, the reflecting sound wave will differ from the original wave; the technicians will mark the location of the defect, according to the different sound waves, and then inspect and repair the defect. The Lockin Thermography NDT method uses infrared to generate interior heat flow and measure surface temperature, and affords the added benefit of being able to inspect a large area. By recording the surface temperature with an infrared camera and applying an appropriate mathematical analysis, an image is calculated that shows the internal structure of the part with the defects. As a yacht is prepared for delivery, Horizon performs a series of water leak tests to ensure that the yacht is completely watertight. These tests simulate weather conditions during a monsoon, using thousands of gallons water to shower the yacht from various angles for 2-4 hours. Horizon's leak test is important in guaranteeing the yacht is completely sealed and safe from outside water sources. Every Horizon yacht undergoes a rigorous sea trial involving a third party survey to ensure proper systems operation and maneuverability. The maneuvering trials include a speed test, turning circle, emergency stern propulsion, stopping inertia, zigzagging with power loss stability tests and a full-power endurance test. These tests also include sophisticated data analysis of frequency and harmonics onboard as well as include trim level tests at varying power loads. All major equipment, such as anchors, thrusters, safety equipment and fire-fighting systems, are tested and detailed records of all these tests are kept in a database for future reference. “Define your Horizon” is not just a slogan — Horizon makes every effort to ensure that each customer’s dream becomes reality. Managing the various requirements for each customer requires an extensive system of checks and balances to assure every detail is addressed and each request fulfilled. Horizon has developed its own ERP system to supervise every yacht order, from the initial discussion and layout to the delivery and after-sales service. This system covers customer's input, construction details, product schedule, material procurement, quality checks and customer feedback. Customers’ visions are translated into thousands of construction orders and material lists, and the system organizes that information, delivering it to the right person at the right time.